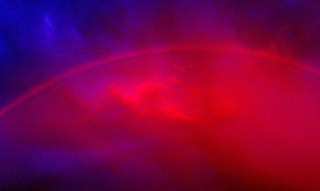 It was Robert Greenler who, having deduced that there should be an infrared component to a terrestrial rainbow, finally succeeded in photographing a natural one in 1970. I've had a go myself and if the sky does what you need and the camera is steady enough it is not too difficult to give it a go yourself. Scientific American recently published an article entitles Think You Know Rainbows? Look Again, which discussed and showed examples of rainbows that were not particularly rainbow coloured, including a white one and a red one. The red example in the article (reproduced above) was taken from the Wikimedia Commons, and was taken by Jason Campbell in 2011. The cause, as the article explains, is that the light source is a setting sun and at this point only red light was available to be refracted by water droplets to form the bow. You probably see where I'm going here. Let's assume that near-IR is also in the sunlight as the sun sets and that this remains a little after the red has gone. In this case it should be possible for an infrared-only rainbow to exist. Presumably anyone with a suitable light source and some fine mist could produce one in the lab but has anyone managed to take a photograph of such a thing 'in the wild'?